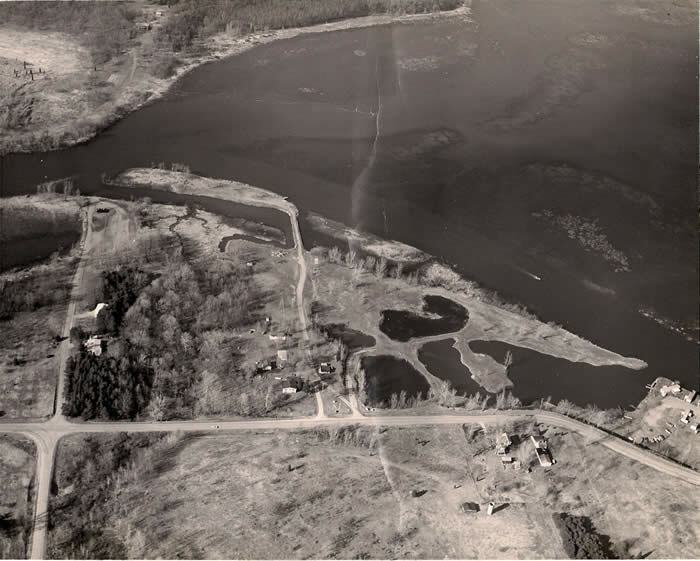 This is an aerial view of the farm, looking north, taken, I'd guess, around 1972. The road from left to right is "the river road", today called Riverside Road. 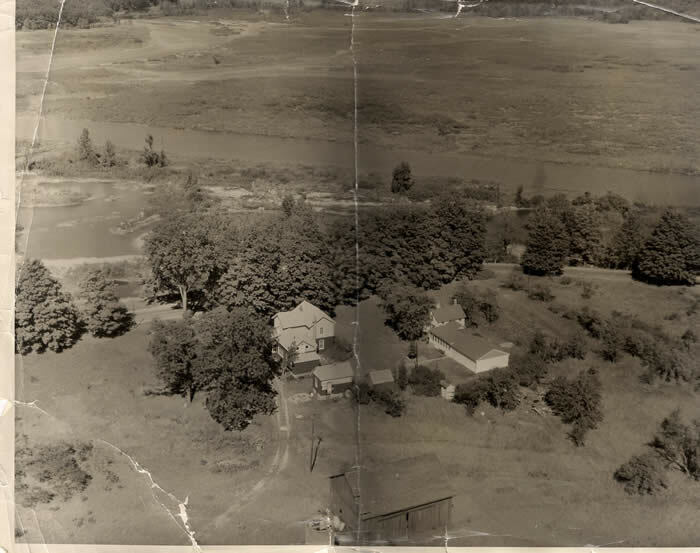 The farm is to the south of that road, from the road on the left (63rd St) to the curve to the right where you can see the two original houses, the circa 1885 farm house, called the big house, and the little house. At this time the little house was owned by John and Ann Guilfoil, my great-uncle and aunt. There is a fence around the big house. The fence was built by my aunt Patricia Audett when the old farm house was sold, about the time this picture was taken. The silo is visible to the southwest of the old farm house. There are trees on the left side of the picture, near 63rd St. That is where the gully and the creek are. Patsy's new house built around 1972 is located east of 63rd St just below the bottom of the picture. Two major differences are immediately noticeable to anyone who knows the farm today (2008). First, most of it is treeless because Patsy pastured horses on it. Her barn is to the left of the silo. Today there are many more trees, especially to the west of the barn and the silo. Second, the water level on the river is high compared to today. To the northeast lie the Pottawattomie marshes in the Kalamazoo River. Today these areas are above the waterline. In this picture they are submerged. Below -- a closeup of the big house, the little house and the old barn. It dates probably from the late 1950s, before the old barn was taken down. Note the top of the silo to the left of the old barn. The water level is considerably lower than the picture above. A child in Albert's garden, early 1940s?